v, 63 leaves : ; 28 cm. Thesis (Ph. D.)--University of Florida, 1991. Includes bibliographical references (leaves 60-62). Copyright [name of dissertation author]. 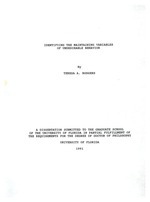 Permission granted to the University of Florida to digitize, archive and distribute this item for non-profit research and educational purposes. Any reuse of this item in excess of fair use or other copyright exemptions requires permission of the copyright holder. Response definitions and direct observation. *. .. .. .. ..
a C r-. a-a 4.
the Mentally Retarded, 20, 25-38. A.C., Felce, D., & Barton, L.E. on hypotheses of their causes. Motivation Assessment Scale: A failure to replicate. the Degree of Doctor of Philosophy. the Degy e of Doctor/ff Philosophy. the Degrpe of Doct4r of Philosophy.